Everyone knew Game 2 between the Rockets and Blazers was going to be a much closer game than the blowout win by Houston in Game 1. The question was who would make plays down the stretch and who wouldn’t. That’s really the main question in a series where the teams are evenly matched like they are in this one. As expected, the game was tied 72-72 entering the fourth quarter. Houston made 9-of-18 shots in that quarter, which isn’t bad, but it really boiled down to a few possessions down the stretch. 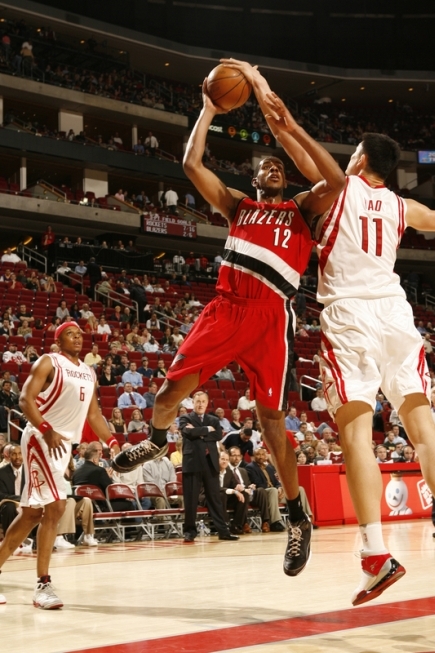 It also came down to Brandon Roy and Lamarcus Aldridge, who carried the load with 42 and 27 points respectively, making plays when Houston didn’t. Result: Blazers 107, Rockets 103. Yao Ming was one of several Rockets who tried to slow down Brandon Roy, but to no avail. Roy would light up Houston for 42 points. Click here for more game photos. – Obviously not being able to stop Brandon Roy ALL GAME LONG. Before the series started, Houston fans had to feel good that their team supposedly had the two best defenders you could hope to find on one team to defend him: Shane Battier and Ron Artest. It didn’t matter. 15-of-27 from the field for 42 points is a good old-fashioned torching, and he was consistently doing it all game long, scoring 9 to 12 points each quarter. If Houston had at least contained Roy, it would have been a W for Houston. Sorry, but I still think Battier’s defense is overrated. He’s a good defender, but I don’t think he shuts down his opponents as much as he used to be able to do. That’s another topic for another day. – Not being able to stop Lamarcus Aldridge, either. He scored 27 points on 11-of-19 shooting. – Five turnovers in the fourth quarter, including crucial ones in crunch time (as described later on at the bottom of this post). – As Rick Adelman said after the game, Houston wasn’t “patient” all game long, jacking up “flyers” and not trying to get a better shot by getting the ball into Yao. Main culprit: Ron Artest, who was 2-for-12 after the first quarter, and missed all six of his 3-pointers after the first quarter. For example, late in the 2nd quarter, the Rockets led by 6 points, but then Artest jacked up two bad 3-point attempts in a row that helped Portland go on a 10-2 run while Houston went scoreless the last 3 minutes of the second. Then in the fourth quarter, Houston went almost 7 minutes without hitting a field goal because of bad shot selection and turnovers, which helped Portland go on a 19-7 run to take a 98-90 lead with 1:03 remaining . – Terrible calls by the officials, especially the terrible call on Yao from referee Joey Crawford, who fell for a flop by Joel Pryzbilla with 6:50 remaining in the 3rd quarter who flailed his body wildly on an offensive rebound while he was lightly entangled with Yao, handing Yao his 4th foul. That forced Yao out of the game, and the Blazers would make a run as the Rockets’ offense struggled. Thankfully Brooks would come through with 7 points late in the 3rd quarter to help keep the game tight at 72-72 entering the 4th quarter. – Adelman said after the game they need other players to step up when Yao can’t get touches. But I think he kind of hindered their chances when Adelman himself decided to pull Von Wafer, who was having a great game with 21 points, for Shane Battier with 2:47 remaining and the Rockets down 93-90. Of course, Battier didn’t take a shot, only taking 2 shots for the game and only scoring 3 points. I have a feeling when Adelman says other players need to step up, Battier is one of the players he’s talking about. I predicted before this series that if the Rockets lose it and Battier doesn’t amp up his scoring output, the Rockets have got to think about trading him. He’s just too much of an anvil around their neck for other players to make up for his lack of offensive production. – The Rockets missed 10 free throws, with Luis Scola missing 4 of them. They shoot around 80% as a team, but only shot 69% Tuesday night. – Adelman also said they needed to have more presence at the rim. Having Dikembe Mutombo go down late in the first quarter with what’s probably a career-ending knee injury was very depressing to watch. Not having him in there to contest shots hurt things as they suddenly became much smaller inside the paint where the Blazers scored 40 points. – With 1.5 seconds remaining, Aaron Brooks hit the 2nd of two back-to-back 3-pointers which closed the deficit to only 2 points. On Portland’s inbound pass, Rudy Fernandez fell down, and the refs called a foul on the Rockets just because they thought he must have been fouled! The replay clearly showed he wasn’t. If the refs had called that play properly, the Rockets would have had the ball and would have had a chance to win the game! Jeez! Yao only scored 11 points on 3-of-6 shooting (5-for-5 from the line), but it wasn’t like his teammates completely ignored him. Artest scored 15 points on 6-of-9 shooting in the 1st quarter, so you can’t be too upset when another player is being that productive. You go with the hot hand while you can. Then once he cools off, you go back to Yao once he’s back in the game. In the second quarter, Yao rested most of the quarter like he normally does, and the bench of Wafer (10 points), Kyle Lowry (6) and Carl Landry (4) scored 20 points collectively, especially Wafer and Lowry who continually attacked the basket all game long. Not bad, and the Rockets were competitive, only trailing 53-51 at the half. That 3rd quarter was where Yao could really inflict some damage, but he was robbed from being able to do that when Crawford fell for Pryzbilla’s flop, forcing Yao out of the game. By the time he came back early in the 4th, the team chemistry was out of whack. Aaron Brooks played well, except for two crucial turnovers late in the game. He led all Rockets with 23 points on 9-of-12 shots, including those 7 points in a row late in the 3rd quarter to get them back into it. He also hit a couple of spectacular 3-pointers when the game was basically decided, but it shows he’s a competitor. Just as important, you can tell his speed is being respected by the Blazers, who are making sure they send help to defend him when he drives toward the basket. He made them pay by dishing 5 assists, but those two TOs late in the game were killers. Looking ahead to Game 3 Friday night, the Rockets should be pissed they let this game get away, not helped at all by the refs calling bogus fouls throughout the game, especially that 4th one against Yao. Having that chip on their shoulder will help. Also, playing at home is huge, especially since Portland is only 2-11 on the road against the other 7 Western Conference playoff teams. And when two players like Roy and Aldridge have to score 69 points collectively to win a playoff game, your chances of winning a series go down. Remember the past two Rockets-Jazz playoff series when the Rockets didn’t have enough firepower across their lineup to win those series? Now without Dikembe, Carl Landry, Chuck Hayes and Luis Scola are going to have to step up their defense, and Yao is going to have to log a few more minutes than he normally would to give them some size. That’ll mean staying out of foul trouble, and for the league NOT to assign Joey Crawford to officiate that game. It also wouldn’t hurt if the players dedicate themselves to try to get their fallen teammate, Dikembe, a ring in his final season as he watches the remaining games of his storied and illustrious career from the sidelines. Not much could have been as devastating as the loss the Rockets had against Dallas Wednesday that dropped Houston from maybe getting the 2nd seed all the way down to the 5th seed and losing home court advantage. All the fans were down on them, I was down on them, and Portland had tons of momentum heading into the playoffs after beating their last 6 opponents at home by an average of 22 points per game. But give the Rockets all the credit in the world for believing in themselves, coming out with a vengeance, being resilient like they have shown all season long, and thrashing Portland 108-81 to take a 1-0 lead in the series. Just like that, the Rockets have gained home court advantage. This game tells us the Rockets have the talent and athleticism to win this series, and that it all comes down to their mental approach to the game, starting with Yao. He delivered Saturday night. Yao came out focused and determined from the beginning of the game like he was trying to throw the monkey not only off HIS back for not ever winning a first round playoff series, but also McGrady’s, Steve Francis’ and every other teammate he’s had since 2002. The power of Yao: Joel Pryzbilla had a hard time stopping Yao on Saturday night. It was perfection for #11: 9-of-9 from the field for 24 points as the Rockets rolled. Click here for more game photos. Yao would score 9 of the Rockets’ first 11 points, 14 of their first 18, and had 24 by halftime on 9-of-9 shooting. He was unstoppable with his signature shots: the turnaround jumper and jump hook. I can’t remember a game in Yao’s career where he was so dominant from the get-go. Give him credit for shouldering the load and taking the number of shots you’d expect your franchise player to take if he’s open. Even a terrible blocking call by the refs on Yao while he was stationary and standing OUTSIDE the semicircle when Rudy Fernandez barreled into him couldn’t stop him. At halftime I thought there was no way he could keep up the pace he had set. Yao rarely plays two phenomenal halves together in one game. He’ll either get defended more aggressively, get tired, lose concentration, or a combination of all three. One reason for his success in the first half is because he was played 1-on-1 by Joel Pryzbilla, not fronted. Portland probably did that so they could surprise him with a fronting defense in the 2nd half, like Dallas did the other day, so that he and the coaches wouldn’t have as much time to make the necessary adjustments. But after Yao picked up his 4th foul 5 ½ minutes into the 3rd quarter, it really didn’t matter because the Rockets had such a commanding 74-53 lead, there was no way even the Rockets could blow a lead that big. So that was it for Yao: Rick Adelman opted to rest him the remainder of the game, finishing with the same points (24) made on 9-of-9 shooting, 6-for-6 from the line, and 9 rebounds. He also was focused defensively, blocking 2 shots in his 24 minutes of play. Dikembe Mutombo picked up most of his minutes the rest of the way, logging 18 for the game, probably the most time he’s spent on the court in one game in months, if not a year. Perhaps Adelman had been saving him all season for the playoffs. I loved Deke’s block of Brandon Roy at the rim with 1:17 remaining in the 3rd quarter. The Rockets need more of that. The other player who really stepped up who everyone has been doubting lately as Houston’s answer at point guard was Aaron Brooks. Without him complimenting Yao in the scoring column (27 points), this game might have had a different outcome. A.B. had the game of his life in front of fans from his Oregonian days: aggressive all night long, attacking the basket knowing the Blazer guards can’t keep up with him, and Adelman deciding to spread the floor to give him, and other Rockets, bigger lanes to the hoop. Brooks scored 13 points in the first half on 5-of-8 shooting, hitting cold-blooded shots like we hadn’t seen from him in quite some time — all of which we had wish he had done on a more consistent basis this season. The play that best typified Brooks’ speed and talent occurred at the end of the first half. With 4.4 seconds remaining on the clock, he took the ball from the opposite end of the court, weaved through defenders, and scored a runner off the glass at the buzzer to make it 62-44! That play got he and the entire bench fired up as they headed to the locker room for halftime. In the past, only OTHER teams’ point guards seemed to be able to do that, but now Houston’s can. Brooks’ 27 points came on an efficient 10-of-17 shooting, including 5-of-8 swishers from 3-point land. He’s young still, and he’ll continue to have ups-and-downs, but time will tell if he’s just a little better than Luther Head, or he’s on his way to Tony Parker-like status. I was asked by a certain basketball publication (online version) which I won’t name (yet) to provide my prediction for the Rockets-Blazers series. I was flattered they asked, and I sent it to them yesterday. Before the Rockets blew their 14-point 3rd quarter lead to Dallas in the regular season finale, Houston was headed for a dream setup in the playoffs as the #3 seed: Home court advantage, a series against the Hornets/Spurs/Blazers, and they were out of the Lakers bracket for the next playoff round. Under that scenario, I predicted the Rockets would go all the way to the Western Conference finals. That all changed with their choke job Wednesday night against the Mavs. Now after dropping all the way to the 5th seed, no home court advantage, and having to play against a tough and athletic Portland team, the Rockets are psychologically damaged, dreaming about what could have been. Meanwhile, they are also still trying to figure out how to win tough games on the road against good teams, and will continue to fail to exploit the defense when Yao is fronted, for some dumb reason. As a result, I predict they’ll make a series of it against the Blazers, but will ultimately lose once again in the first round. The monkey will still be on their back for not winning a playoff series in over a decade. After that, the off-season will be interesting with major changes expected. Except for Yao who is still untouchable, I expect Artest will not be signed, and Shane Battier, and maybe even Aaron Brooks, will be traded. They’ll do that in pursuit of trying to acquire a scorer who can complement Yao, and who can deliver with clutch performances late in games to put them over the top. So there you go, my official prediction. [UPDATE: to their credit, the publication ended up updating my post to my original version right here. One of the commenters criticized the incorrect version posted because it didn’t make sense]. It ain’t pretty, but in order for the Rockets to get to the next level, they will have to go through a little more pain on their way to finding the right players. I really think they’re only 1 or 2 players away. The only way I see Artest coming back is if there is NOT enough money for him to make elsewhere through free agency (in this economy, the $ may not be there), and he accepts a mid-range offer from the Rockets that doesn’t bust their bank so they can sign that big-time scorer I mentioned earlier. The decision for Ron to come back to the Rockets will be on him, but only at the right price for the Rockets. Enough of the off-season talk: let’s see if the Rockets can go out there and prove me wrong! Here’s that awesome dunk from Von Wafer yesterday. It’s so good, it’s better than some dunks I’ve seen in slam dunk competitions where it takes them a few times to get it right. Click on the little ‘HQ’ button to reduce some of the graininess from the videos. And here’s Yao‘s dunk over Greg Oden from earlier in the game. Throw it down, big man! I love both Von and Yao’s reactions! Chills. Thanks to piyong for finding these. The Rockets may have disappointed many fans earlier in the week by showing they aren’t very strong in fourth quarters, on the road, against playoff teams. It was a sad reality check that doesn’t bode well for a long run in this year’s playoffs. But Sunday night the Rockets picked up their fans a bit with an encouraging win against potential playoff foe Portland, a very dangerous team. It got tight at times, but they came through when they needed with a 102-88 win, and have almost assured they will have home court advantage if they face them in the first round. Yao Ming had a solid game against the Portland big men, scoring 21 points and grabbing 12 boards. Click here for more photos. That’s because the Rockets are now ½ game ahead of the Blazers with 5 games left to play, and now hold the tiebreaker. And with the Spurs’ loss to Cleveland on Sunday, the Rockets are only ½ behind the Spurs for the 3rd seed. But watch out: the Jazz beat the Hornets on Sunday, gaining 1 full game on New Orleans, and the Jazz are now only ½ game behind the Hornets for 6th place (#3 vs #6 will play each other in the first round). So a Rockets-Jazz first round playoff series could still happen. The Blazers game was obviously huge because I heard during the Rockets’ radio broadcast that Daryl Morey’s staff had calculated the probability of the Rockets having home-court advantage for ANY playoff serious would have dropped to 11% if they had lost this game, whereas by winning it, the probability increased dramatically to 65%. There were times during the game when I thought, “Here we go again,” like when the Blazers made a run to pull within striking distance. But to their credit, in the fourth quarter players like Luis Scola and Von Wafer stepped up to hit some big buckets to put the game away. Perhaps no score was more dramatic than the one with 8:25 remaining in the game. With the Rockets only up by 8 points, Wafer drove the baseline and threw down a FEROCIOUS ONE-HANDED REVERSE JAM!!! WHICH GOT THE WHOLE BUILDING ROARING AND ON THEIR FEET! I’m sure someone will put it on YouTube, and if anyone finds it, post a comment at the end of this post and I’ll make sure to highlight it. That dunk had to be the most athletic dunk I’ve seen by a Rocket since Clyde Drexler was in a Rockets uniform, and is sure to be seen on Sportscenter’s Top 10. I believe one of the keys to the game occurred as early in the second quarter when the Rockets had a 46-39 lead, their offense with Hayes, Scola, Battier, Artest and Lowry was bogging down, and were definitely in need of something solid on offense. That’s when they played smart and got the ball to Scola in the low post, and Scola delivered on 2 straight possessions with scores in the block (both over Lamarcus Aldridge), putting them up 50-39 to get some breathing room and put them back on the right track. That is, until the 3rd quarter when, after the Rockets built a 14-point lead, gave it up again and the Blazers kept hanging around down by 7 most of the quarter. That’s when Yao put a little hook shot in the lane, missed, BUT GRABBED THE OFFENSIVE REBOUND, PUMP FAKED ON GREG ODEN, AND THREW IT DOWN OVER HIM! THAT GOT THE BENCH AND CROWD OFF THEIR FEET AGAIN! That play extended the lead to 69-60, but it was one of the few bright points in a quarter where the Rockets shot only 24%, but were fortunate to lead 72-64 at the end of 3 quarters. Against Portland, that’s not a safe lead considering the Blazers had come back to win 10 games this season when trailing after 3 quarters. That’s when Wafer hit a huge bucket over Oden in the lane, putting the Rockets up 76-70. Ron Artest would follow-up with a jumper to push it to 78-70, and that’s when Wafer threw down his jaw-dropping reverse jam to give the Rockets a 10-point lead. Wafer would hit another jumper a couple of minutes later to push it to 86-76, giving him 12 points on 5-of-7 shooting at that time. I’m still loving the Wafer story. Once the playoffs start, he could really show the rest of the league how much of a stud he is. Sandwiching a huge Shane Battier three-pointer was Scola, who kept the points flowing by hitting two long jumpers, then another about a minute later to put the game away 95-82 with 1:55 remaining. Scola’s 16 points on 8-of-10 shots Sunday night was what they needed from him when the Rockets lost against the Suns, but it’s so rare for him to have a bad game, it’s really unfair to complain. I still think Scola is one of the most underrated players in the league. But Yao was the biggest difference, scoring 21 points on 6-of-10 shooting, and hitting 9-of-11 from the line. His 12 rebounds were encouraging in that 6 of them were offensive boards, a very high ratio for him, especially considering the Blazers’ front line is tall with Joel Pryzbilla, Aldrdige, and Oden. He won the battle against Oden, who played only 11 minutes and scored 4 points as Pryzbillla’s backup. Yao also had 3 assists, two of them spectacular, one coming late in the first quarter from a beautiful give-and-go bounce pass to a cutting Chuck Hayes for a layup. Then early in the second quarter, Yao whipped a pass to a cutting Kyle Lowry for another layup! If Yao continues to be a threat in the passing lanes, watch out. It was a complete and balanced game, with 5 Rockets scoring in double figures (Yao, Scola, Artest, Wafer, and Aaron Brooks). Brooks had 14 points on 5-of-12 shots, and showed why the Rockets had such faith in him to give him the starting PG job. Two other players finished close to double figures with 9 points: Battier (3-of-11, with all 3 shots made being 3-pointers), and Chuck Hayes (of all people), hitting 4-of-7 shots and grabbing 10 boards. Hayes was also able to hold Aldridge in check, who ‘only’ scored 22 points on 7-of-15 shots, not bad considering he scored 35 points against Oklahoma City. I never thought I’d say an ugly win could be so beautiful as it was Tuesday night when the Rockets beat the Blazers 98-94. Houston had blown a 15-point lead in the fourth quarter with less than 6 minutes remaining, a lead that got whittled down to 2. But rather than collapse like they did several times before the All-Star break, this time the Rockets found a way to win. Rather than jump on them and lament how the team continues to struggle in putting teams away like they did so many times this season with McGrady and Alston, it’s hard to do that this time. That’s because we know they finally have a cancer off their team that will allow their healthier “cells” to grow over the time. Also because they’ve got a starting point guard who can actually hit big shots and free throws down the stretch, like Aaron Brooks did by draining 2 big free throws to make it 94-90 with 21.5 remaining. The rest of the way the Blazers fouled Ron Artest twice, and like a true superstar, he hit his free throws when the chips were down. Those 4 FTs were a majority of the points the Rockets would score (7) in the last six minutes, all coming from FTs. Artest may not have had the best shooting night (5-of-13), but he made 9-of-10 free throws on his way to a team-high 20 points. He also had 5 rebounds, 5 assists, 3 steals, and only 1 turnover. Two of my favorite plays from the night involved Artest when he did a pick-and-roll with Luis Scola in the lane, dumping it off to him for a layup. Then later, Artest grabbed a defensive rebound, dribbled it coast-to-coast on a semi-fast break to the other end, and dumped it off to Scola for another layup! It’s rare to see a player this versatile: a burly small forward who can play power forward and post-up in the lane, or start in the backcourt with Brooks and be dishing dimes on fast breaks. Scola would finish with 15 points on 5-of-9 shots, plus 11 rebounds, including 2 or 3 in the clutch that kept Houston possessions alive and staved off the Blazers’ comeback attempt. Aaron was fantastic with 20 points on 8-of-20 shots, but it was the way he made those shots that was impressive. It just wasn’t off 3-pointers (2-of-5). He attacked the basket more than Rafer Alston did, blew by defenders, and scored on at least 4 layups Tuesday night because of that aggressiveness. He also had some sweet dribble moves to get into the lane, then would elevate and pop a jumper over defenders who were backing up because they thought he was taking it to the rack. It’s a sweet move, and almost impossible to defend. Yao had a so-so game. He ‘only’ scored 15 points on 6-of-15 shots. He missed his first 4 shots, which included 2 back-to-back dunk/layup attempts within a few seconds of each other in the first quarter. The first dunk attempt was a one-handed jam attempt over Joel Pryzbilla, who appeared to get a hand between the ball and the rim. But Yao’s second miss was a flat-out blown layup from underneath the rim, and Yao had to slap his hands frustration that he had missed such an easy shot. Yao’s night was even more frustrating because referee Scott Foster fell for two Pryzbilla flops by calling them as offensive fouls on Yao. They were absolutely ridiculous calls. Pryzbilla flopped on Yao 4 times in the game, getting caught only once. Click here for more photos from pre-game and the game itself. But fortunately Foster would finally expose Przybilla for what he was when Pryz went to the well too often in the fourth quarter with 2 flops on Yao within a few seconds. 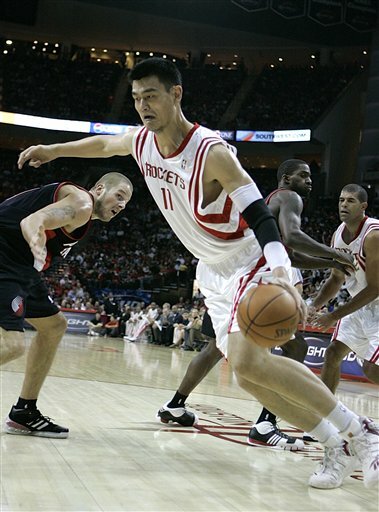 The second flop is when Foster called him for a defensive foul, giving a little bit of payback for Yao. The first half for Houston was incredible as they scored 60 points, and in the second quarter the reserves came in – like Von Wafer, Chuck Hayes, Kyle Lowry – who actually widened the lead after Yao went out, going on a 34-17 run without him. 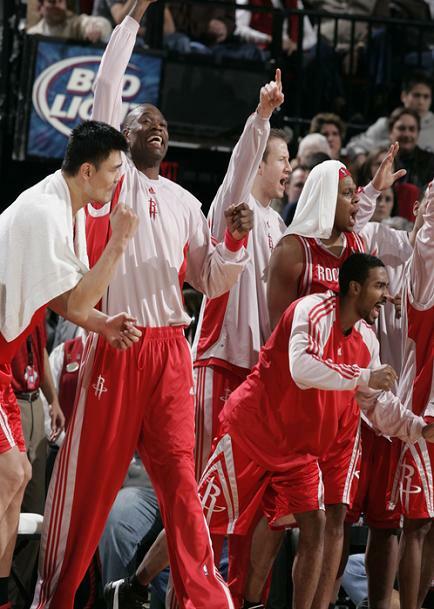 During that scoring outburst, I loved how the bench (including Yao) was on their feet cheering them on and pumping their fists! I’m still hurting after that loss against Sacramento on Tuesday night and how mediocre the Rockets have played since the 22-winning streak ended. But Houston’s win against Portland on the road Thursday night makes me hopeful that the Rockets can get back to the way they were playing during their historic run. They still had times where they struggled, like when they gave up a 16-point lead in the 2nd quarter and eventually fell behind by two points with 3:50 remaining in the third. At that point, I thought they were ripe for a collapse. And all of this was happening without last year’s rookie of the year – Brandon Roy – playing for Portland because of an injury. Without Roy in the line-up this season, the Blazers had lost 6-of-7 games. But give credit to Tracy McGrady for finally finding his shot. He had been 5-of-15 by the time the Rockets fell behind by two points, 63-61. But then he exploded by hitting 5 of his next 6 shots to help Houston go on a 13-0 run to finish the third quarter, giving the Rockets a 74-63 lead headed into the fourth. The Blazers would cut the deficit down to 7 points a couple of times in the fourth, but the Rockets would respond and finished strong to win 95-86. 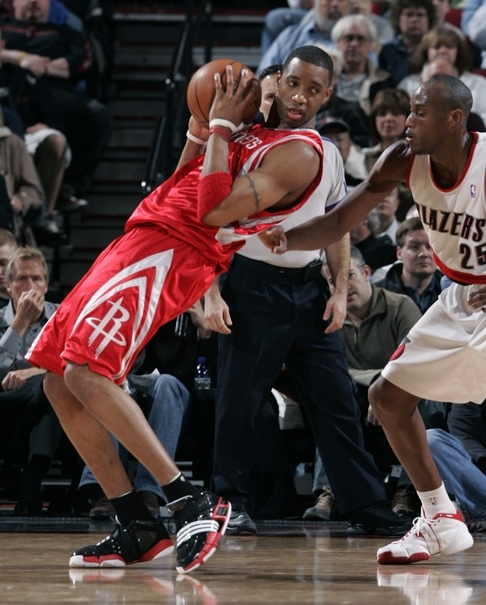 McGrady was in more of an attack mode in this game, and it made all the difference. On top of the 35 points he scored on pretty decent 14-of-29 shooting and 4-of-6 from three-point territory, he would dish 6 assists. 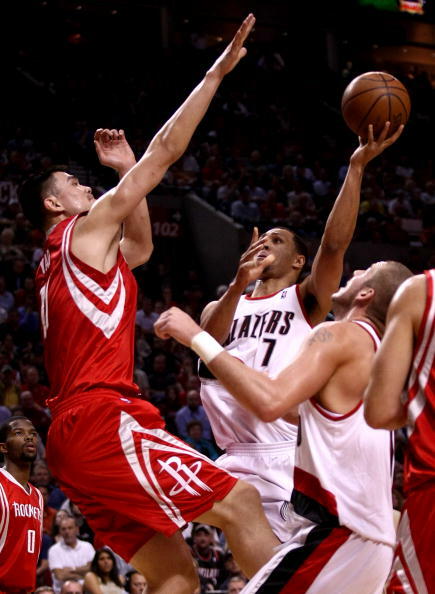 Yao gets a hand on Portland’s Lamarcus Aldridge’s shot Monday night in Houston. Yao would lead all scorers with 25 points as Houston won its 7th game in a row, 95-83. Click here for more photos from the game. Although the Rockets won their 7th game in a row Monday night against a team they are battling for a playoff spot, there are still enough issues the Rockets need to correct considering how they played in a 95-83 win in Houston. Not to be a spoil sport, let’s first talk about the things they did well Monday night. Yao was the force in the middle we expect him to be against a smaller front line of Joel Pryzbilla and Lamarcus Aldridge, leading all scorers with 25 points on 7-of-11 shooting, 11-of-13 from the line, and grabbing 7 boards. Just another day at the office for Big Yao. Houston’s defense was great in the second half, holding the Blazers to 15-of-34 shooting. Shane Battier really put the clamps on All-Star guard Brandon Roy, holding him only to 15 points on 5-of-13 shooting (it didn’t hurt that Roy missed 5-of-10 free throws). Yao Ming, Dikembe Mutombo, Luther Head and other Rocket players cheer on their teammates during the 4th quarter of a big win in Portland. 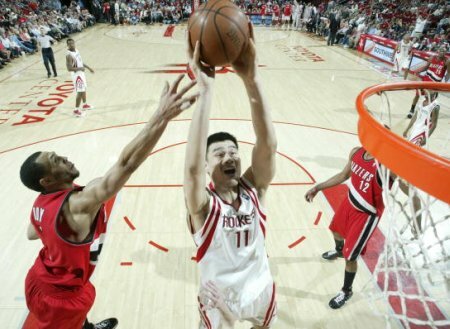 Yao only scored 11 points (but had 10 rebounds) as the Rockets ended the Blazers’ 12-game home winning streak. With the way the Rockets played during big stretches of their game against Portland Friday night, you thought there would be no way they could beat the Blazers to make them lose for only the four time in 21 games at home this season. In addition, the Rockets are only 3-15 when trailing at halftime, which was the case in this game as they trailed 50-42 at the intermission. Their chances didn’t look good. But with the help of the guys we have been saying for weeks are “for real,” rookies Carl Landry, Luis Scola and Aaron Brooks came up big in an 89-79 win to give Houston its fourth win in a row (fifth on the road!) and pull within 1 game of the Blazers and Utah to tie for the 8th seed in the Western Conference playoff race. Thank goodness coach Rick Adelman seems to finally realize the value of all 3 of these guys to play them in crunch time, like many of us have been saying all year long. The Rockets needed all they could get from their reserves since Yao Ming only had two field goals for the entire game (2-of-8 overall), with no FGs in the first half, which had to be a first. But the Big Man made a big-time contribution from the free throw line, hitting 7-of-8 to finish with 11 points, and grabbed 10 boards. With all the excitement of Houston’s home opener Saturday night against Portland, the Rockets lived up to expectations that a revamped bench and a 2-0 record have created by taking command early and not being threatened too much by a young Blazer team. The Rockets started off the first quarter on an 18-4 run, led by Yao Ming scoring 11 points on 5-of-7 shooting. In that first quarter, he hit a fallaway jumper, a jump hook, a wicked spin move on the baseline for a layup, and a dunk! Yao would finish the night with 21 points on 8-of-17 shooting, 12 rebounds, and 3 blocks. Not a bad night for a guy who says he still feels uncomfortable spending 50% of his time in the high post. Click here for more photos from the game. Click here for video from the game. Yao missed several easy jump shots in the second half that makes me a little concerned about his shooting accuracy. That’s the second game in a row where he has hit a dry spell within a game. But hopefully it’s only temporary and he’ll get those fallaways and jump hooks on target soon.